On Saturday the 8th of September 2018 Indigo Children's Fund and friends will be embarking on a 25km walk along the River Thames and we would love it if you could join us. The walk is to raise funds for our next project helping underprivileged children in rural Nepal. As ever every single penny raised goes directly to our projects, not a penny spent on anything else. OUR TEAM SO FAR: Pam Parker, Johnny Warrillow, Will Deboos, Luke Daynes, Mary Daynes, Ken McDougall, Marion Thomson, Roseanna Bancroft, Pete Schofield, Danae Schofield, Tommy Wills , David Mayes, Andrew Rees, Pauline de Reynal, Rosie Cave, Ben Cousins, Anthony Ferguson, Liv Loffler, Amy Davis, Alya Lilani, Robbie Parker, Trpimir Kujundzic (TK) and Ron Tsang, Guy Warrillow. The girls dance troupe at our soon to be completed school project, Shree Sakala, Devi, Nepal. Last year many of you kindly attended or supported our Thames River Cruise fundraiser. The day was a great success and we raised a large chunk of the money required to build our new school building project in Nawalparasi, Nepal. The building is nearing completion and due to open it's doors in September, on time and within budget. Every single penny raised on last years River Cruise went towards this project and was made only possible by our generous guests and supporters. Please visit the project page for further info. 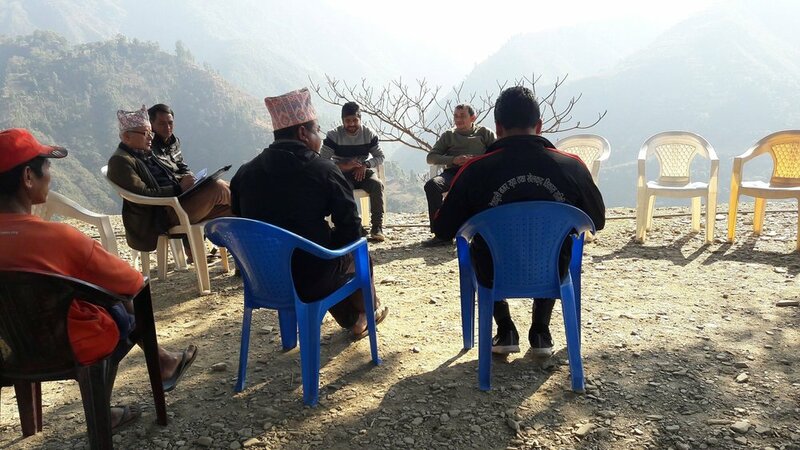 The team meeting at the site of our next project, Nawalparasi, Nepal. More details to follow in the coming weeks.